ENTRIES are already coming in thick and fast for this month’s popular Fairoaks Five and Ten off-road races. The five-mile and 10-mile races – once again organised by the Reading-based firm, Barnes Fitness – both start and finish at Fairoaks Airport in Chobham, and will take place on Sunday, October 26 in support of the Woking Hospices. Route highlights will include Horsell Common, McLaren’s marvellous Formula 1 head-quarters, and even the site of the martians’ landing in HG Wells’ War of the Worlds novel. Entrants in the five-mile race complete one lap, while those who are covering 10 miles will run two. Organiser of the race, Ellie Barnes, said: “Reading Road-runners have chosen the Fairoaks Ten as their championship 10-mile event for this year, so we’re looking forward to seeing many of their members gathering on the start line, raring to go! The races were last staged in April, when more than 150 runners – of all abilities – took part in the five-miler. 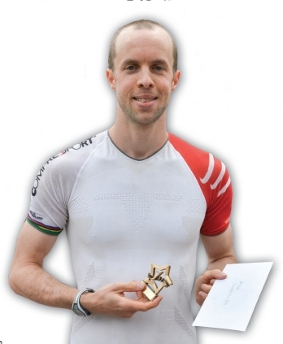 Last year’s overall winner was Datchet Dasher Alex Miller. 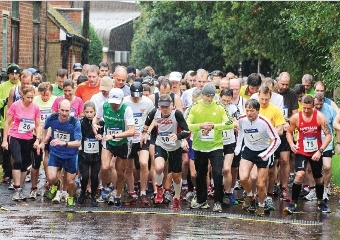 More than 65 runners tested their stamina on the 10-mile course, with previous five-mile winner David Chapman, from Guildford, coming first in one hour and three seconds. The races both start at 10.30am and are chip-timed so that fast and accurate results can be obtained. Two massage services – Keith Rimmer Massage and Real Touch Massage – will be on hand to give free sessions to any runners wanting them, both before and after the event. Also providing support on the day will be Sweatshop, The Running School, Pepperfit, and the Horsell Co-op. Marshalling will once again be provided by members of the Horsell Runners, and event photography will be by snappers from Sports-alive. Everyone who finishes their race will have a commemorative medal best-owed upon them, and there will be prizes for the first, second and third men and women overall, as well as first-finishers by age group. THE minimum age for entry is 16, and entry fees taken on the day will cost an additional £2 on top of the normal fee. For the Fairoaks Five the fees are £14 for UK Athletics-affiliated runners and £16 for the non-affiliated. For the Ten-miler fees are £20 and £22.